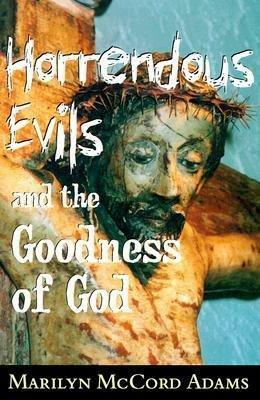 Book Review: Horrendous Evils and the Goodness of God | J.W. Wartick -"Always Have a Reason"
The problem of evil is often seen as the greatest threat to theistic belief. Analytic Philosophers have struggled with the issue on both sides of theism–from Plantinga’s innovative “Free Will Defense” to the claim of the positive irrationality of theism issued by the late J.L. Mackie. This issue doesn’t show signs of slowing down, either. It has dominated philosophy of religion for millenia. In Horrendous Evils and the Goodness of God , Marilyn McCord Adams offers a different kind of defense for theism. She argues that, thus far, the debate has been “…carried on at too high a level of abstraction” (3). She argues that the problem of evil has been directed at theism in general, which has caused philosophers on both sides of the debate to miss the vitally important uniqueness of Christianity and the problem of “horrendous evils” on this view. Christianity, she argues, has several unique tools that can meet the problem of evil more effectively when not abstracted into simply classical theism (3). Adams’ account has the kind of honest, penetrating discussion of real evil in our world about which philosophy would do well to take notice. The little child kidnapped and murdered; the innocent family killed by the drunk driver; the millions murdered by Hitler; these examples all demand answers for the individual occurrences of evil, according to Adams (see her discussion on pages 17ff). Specifically, she writes that “At a minimum, God’s goodness to human individuals would require that God guarantee each a life that was a great good to him/her on the whole… God would have to… [give each person’s life value]… by giving it positive meaning through… great enough good within the context of his/her life” (31, emphasis hers). This stunning claim will likely make the theistic philosopher rock back on his/her heels for a moment. Surely, we cannot be called to account for every individual evil! Adams believes that the Christian theist can indeed do so, not by taking the unconvincing (in my opinion) route of arguing that such persons are having their character built by suffering, but by appealing to God’s goodness to each individual person (55). Specifically, this goodness of God is demonstrated within Christianity by Jesus Christ. After a penetrating discussion of purity and defilement on Christianity and Judaism (see 86ff), Adams argues that in Christ, God “takes the… approach of joining us in our defilement [that is, our suffering of horrendous, individual evils]” (98). This act of Christ means that our defilement from sin, evils, and even horrendous evils has the possibility of becoming holiness (99). Thus, through Christ, and the power of the Holy Spirit’s redefining rebirth of baptism, God offers the greatest good to every individual (102). Through this self-defilement which leads to holiness, God invests meaning by “…being good to all created persons–that is, in seeing to it that each gets a life that is a great good to him/her on the whole, one in which any participation in horrors is not merely balanced off but defeated” (126, emphasis hers). Adams’ thesis, then, is that in Christ, God provides the defeater for horrendous evils by ensuring that each person’s life is a great good. Here Adams rides a fine line of universalism (it seems as though she may be saying every person is indeed saved through Christ, eventually), but her account can be easily modified by those who reject universalism–for one can argue that God provides the defeater simply by offering the possibility of such goods to each person. And God is good to each person by providing such an opportunity. Adams uses the rest of her work to argue further how God’s participation in suffering demonstrates that God has been immeasurably good to each individual. I find Adams’ argument particularly enlightening. Her emphasis on the individual evils of the world is a breath of fresh air as well as a new challenge to Christian philosophers. We do need to address individual atrocities. This doesn’t mean we need to go through, case-by-case, and provide theodicies for each event. Rather, as Adams urges, we can address this by arguing that God is good to every individual through his redemptive act by Jesus Christ. My main critique of Adams in this work is that while I find her issues with abstracting the problem of evil to hit the mark some of the time, I think she underestimates the value of some of the analytic responses to the problem of evil. Certainly, taking evil as a sum total and arguing that God could have some reason for permitting this much evil to occur downplays the importance pf the evil actions towards individuals , but there is a place for such defenses within philosophy. Rather than jettisoning these types of answers, then, I think we would be best suited adding Adams’ defense to the many-faceted response to the problem of evil from Christian philosophers of religion. Adams, Marilyn McCord. Horrendous Evils and the Goodness of God . Cornell University Press. 2000. I can see Reformed theologians trashing this perspective. It flies right in the face of Limited Atonement. Since I do not agree with LA, I have no problem with it. But it seems like while this might be good reasoning to discuss with non-believers, the potential for dogmatic disagreement is very real here. That said, breaking down this argument to the individual level could be extremely valid for many non-theists. When asked to examine their lives, one would have to ask whether more good things or bad things have happened to them. One only needs to show that they are alive each new day to show that the goodness in their lives outweighs the evils permitted by God to show that God’s goodness trumps evil. That really leaves only one question unanswered, “Why is there evil?” The “how could God let this happen?” is somewhat nullified by Adams’ argument. Indeed. If one adheres to Limited Atonement, one would not accept Adams’ argument on any level. I stand ardently against such a doctrine, but that is neither here nor there. Thanks for the comment!